A graduate of the Indiana University School of Medicine, Meeta Shah is a board certified-emergency medicine physician with 10 years of clinical experience. After years of countless patient interactions and treating various conditions, she has a wealth of experience and knowledge to share with readers. The pain could be caused by something as simple as constipation or as serious as a kidney stone. But being aware of the danger signs and symptoms of more serious conditions is important to help you determine when to see a doctor. Here's a list of possible conditions as well as when to seek medical attention. Diverticulitis occurs when these pouches become inflamed, resulting in pain in the left lower abdomen that might also be felt in the back. Other possible symptoms of diverticulitis include fever, nausea, vomiting and constipation or diarrhea. Colon problems other than diverticulitis can also cause pain in the lower left abdomen and back. Something as simple as constipation can cause pain as your colon distends with stool. If painful constipation is associated with bloating and an inability to pass gas, a colon blockage may be present. A tumor involving the last portion of the colon can also cause left-sided abdominal and back pain. Colon cancer is the second leading cause of cancer-related deaths in the United States, reports the Centers for Disease Control and Prevention. Symptoms can include changed stool consistency, bloating and/or bloody stools. 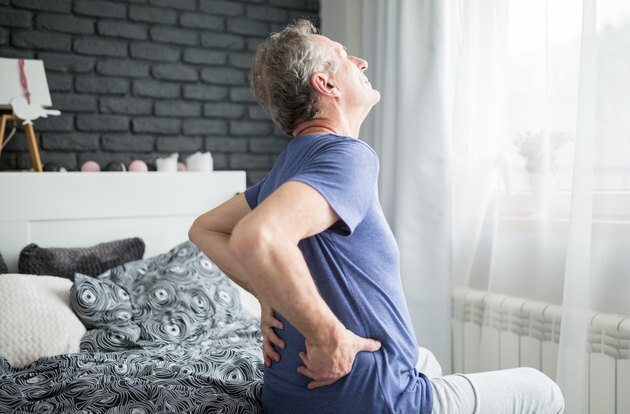 Severe left-sided back pain that radiates into the lower abdomen could indicate a kidney stone or a kidney infection. Kidney stones develop from excess crystal-forming substances in the urine. When larger stones move through the urinary system, they might cause a blockage, leading to pain, bloody urine and nausea. Similar pain can also be felt with a urinary tract infection involving the kidney, a condition called pyelonephritis. Typical symptoms include one-sided abdominal and back pain, burning with urination, increased urinary frequency, nausea, vomiting, fever and chills. A pregnancy located in the left fallopian tube or ovary instead of the uterus — a condition known as an ectopic pregnancy — is another possible cause for pain and may be accompanied by vaginal bleeding. In men, a testicular infection, tumor or twisting of the left testicle commonly causes pain that radiates from the testicle into the left side of the abdomen and back.